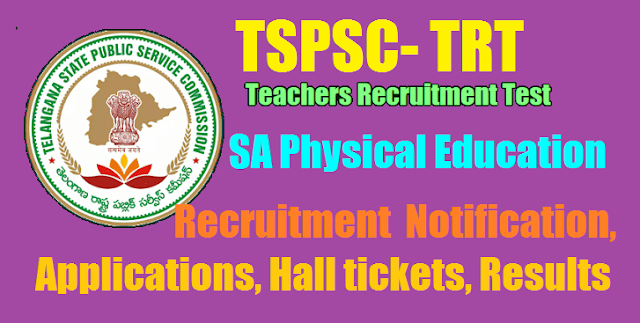 TSPSC TRT 2017 SA Physical Education (PD) Teachers Recruitment Notification, Applications, vacancies, eligibility criteria,Syllabus. TSPSC is conducting the Teachers Recruitment Test for 31 Districts, If a candidate is eligible for more than one notification, he should apply separately for each notification. The applications will be accepted from 30/10/2017 to 30/11/2017. The dates for exam will be in the Vd week of February, 2018. t It should be noted by the candidates who apply for School Assistants, Language Pandits and Secondary Grade Teachers that 80% weightage will be given for written test and 20% weightage for Teachers Eligibility Test (TET) Further for the posts of PET and School Assistants (Physical Education), the selection will be based only on the merit in the written exam and no weightage will be given to the TET. The notifications are hosted on TSPSC website: www.tspsc.gov.in. 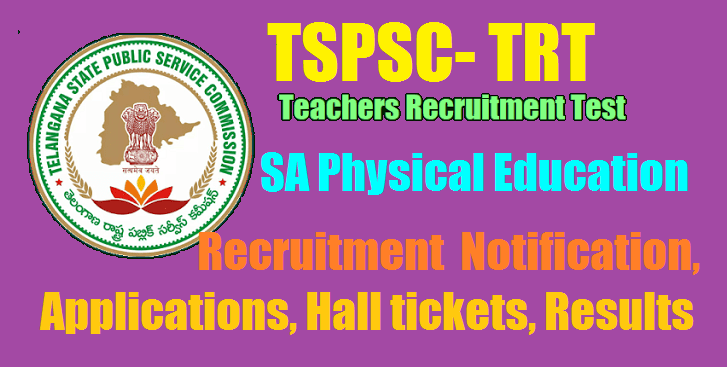 Teacher Recruitment Test In School Education Department School Assistant (Physical Education): Applications are invited Online from qualified candidates through the proforma Application to be made available on Commission’s WEBSITE (www.tspsc.gov.in) to the post of School Assistant (Physical Education) in School Education Department. For SA Physical Education: Those candidates who qualify in the Examination (Objective Type) in order of merit will be called for verification of Certificates, Community and Category wise for the vacancies available as required. The minimum qualifying marks for Selection are OCs 40%, BCs 35% SCs & STs 30%. The minimum qualifying marks are relaxable in the case of SC/ST/BC at the discretion of the Commission. The Examination (Objective Type) is likely to be held held in 2nd week of February 2018.